Parenteral nutrition (PN) provision is complex, as it is a high-alert medication and prone to a variety of potential errors. With changes in clinical practice models and recent federal rulings, the number of PN prescribers may be increasing. Safe prescribing of this therapy requires that competency for prescribers from all disciplines be demonstrated using a standardized process. 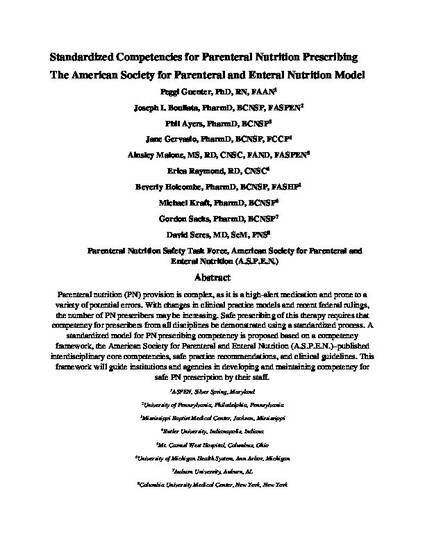 A standardized model for PN prescribing competency is proposed based on a competency framework, the American Society for Parenteral and Enteral Nutrition (A.S.P.E.N. )–published interdisciplinary core competencies, safe practice recommendations, and clinical guidelines. This framework will guide institutions and agencies in developing and maintaining competency for safe PN prescription by their staff. This is a post-print version of an article originally published in Nutrition in Clinical Practice, 2015, Volume 30, Issue 4.